I have wanted to try to make a castile soap batch for the longest. What is "castile soap"? Well that is soap that is made with just Olive Oil. It's a wonderful, gentle soap bar. But it also takes a long time to cure. About 6 months, but the results are worth waiting for. Now some people don't care too much for 100% Olive Oil soap. It can get a little slimy and sometimes you don't have the wonderful bubbles that you can have with other handmade soaps. Keeping this in mind I decided to try a "bastile soap". Now in doing my research for my bastile soap, I kept coming across many soapers doing a water discount. This is when you lower your water content in your recipe so that your soap can trace faster and also cure faster as well. I have always been a little nervous to try water discounts...too chicken to try since I am afraid I may be faced with a picky fragrance that may act up on me and just set too fast. But this time around I decided to jump in with both feet and give it a try!I decided to use Bramble Berry's Lavender 40/42 Essential Oil. I have been saving this fragrance for just the right soap and using it for my first batch of bastile soap would make it even more special :)As always I did add a bit of Goat Milk. I am happy to report that my batch soaped perfectly. No problems what so ever, and for the first time I had no problem whatsoever getting it out of the mold! I was worried about that. I struggle terribly in taking my soaps out of my silicone molds. I think because I use full water and since I have stopped using Palm Oil my soap tends to get a little sticky. I have even tried putting it in the fridge and I just end up with the worst soap ash. But this batch was my lucky one! I am wondering now if I should try doing water discounts on my soaps more often. I always use Sodium Lactate, and with the water discount I think it may be the trick to easily unmold it.I also decided to do a mica swirl on the top and I am really happy with the results! I LOVE MY BASTILE SOAP and can't wait until it's fully cured and ready to use. Just in time for my birthday! It smells amazing by the way. 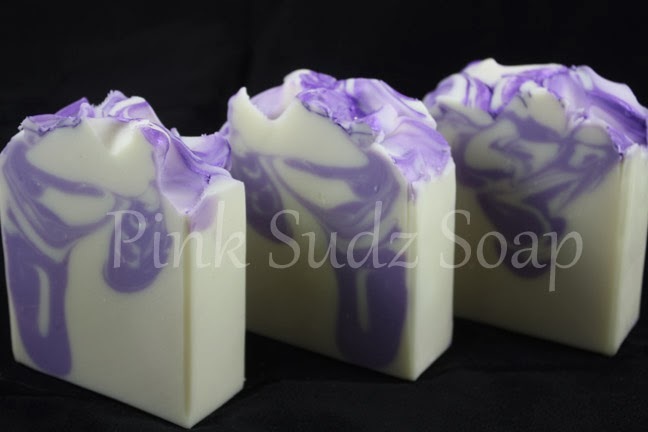 I am usually not so big on lavender scents but ever since I have started soaping I have come to enjoy it. Just as delicate as the lavender flower is. 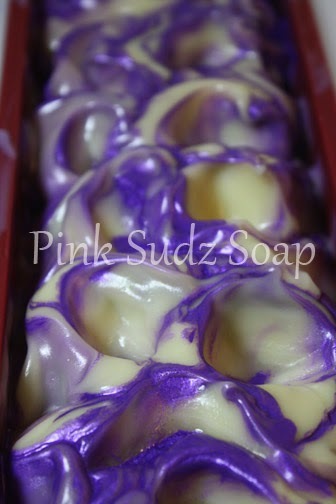 I use in most of my non-milk soaps a little bit of sugar just for the bubbles. 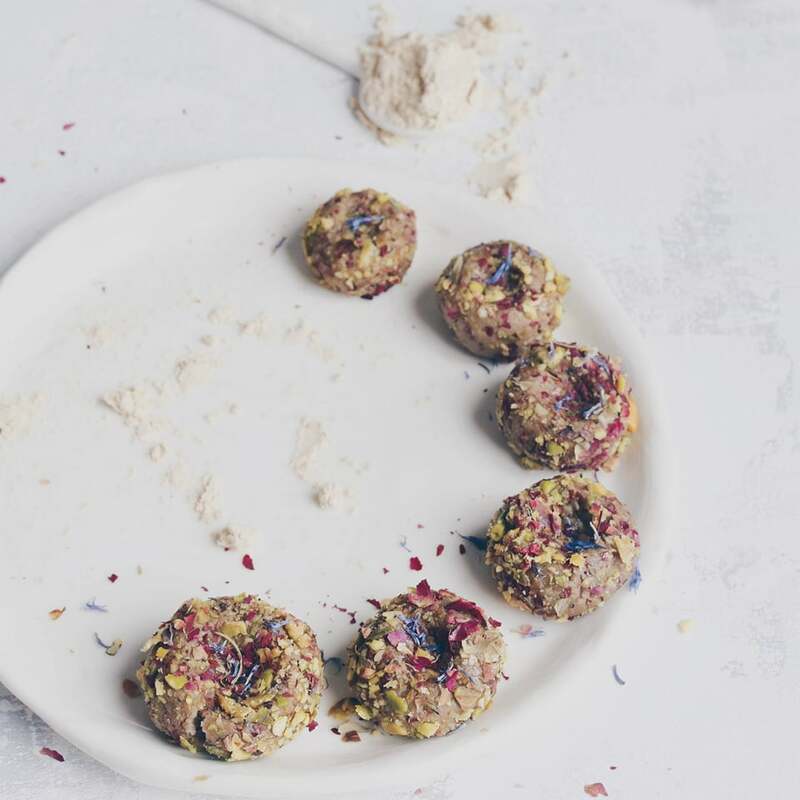 I read that somebody had tested that you get so much bubbles with sugar that you don´t need to use castor oil at all. I use a heavy water discount when I´m making Castile soap, but I don´t think it is necessary when you make Bastile. Such a beautiful tops and swirls, Roxana! I'm not a fan of lavender either,but I like blends with it. You can easily discount water every time you use much liquid oils, try different amounts and keep some water aside,just in case, :-). It's gorgeous Roxana! It's so nice when you try something new and it turns out exactly the way you want, isn't it? It looks fantastic Roxana! I make Bastille instead of castille too, because of the sliminess. My bastille soaps aren't slimey at all, you'll be happy to know. Happy early early early birthday!! Beautiful Bastile, Roxana! I have made a couple of batches of Castile and while it's tough waiting for them to cure, it is definitely worth the wait. I definitely plan to do a much deeper water discount the next time I make another batch. My last attempt took forever to trace and was soft for days. 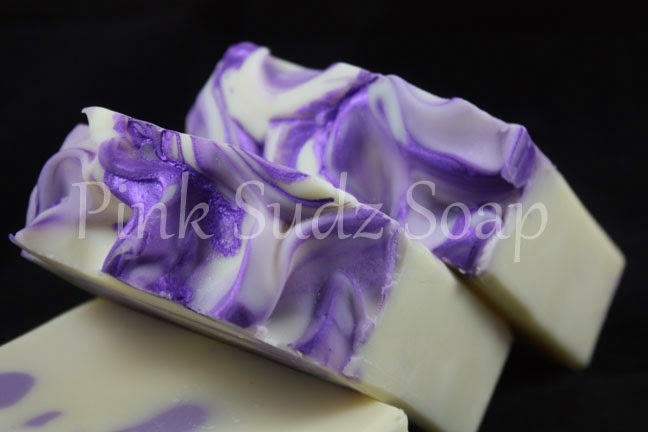 I love the purple swirls in your soaps! That's gorgeous Roxana! The texture on the top of the bar is just wonderful, as is the purple swirl. 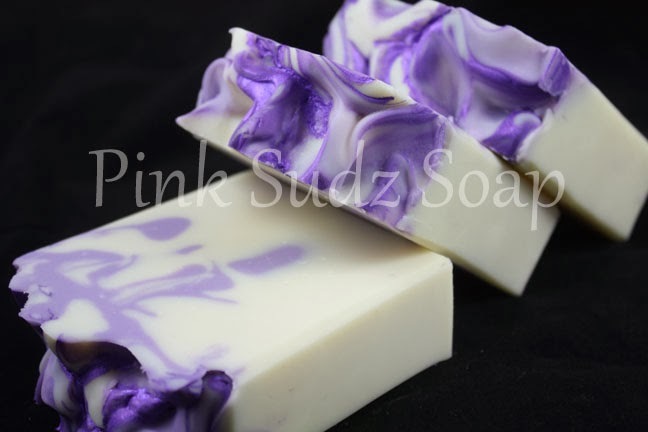 Lavender EO soap is a real best seller for me, so I do have a soft spot for it! I made a Bastile recently for Amy Warden's Taiwan swirl challenge - it's still pretty soft on the curing rack - I think it's going to be quite a while before it's ready! 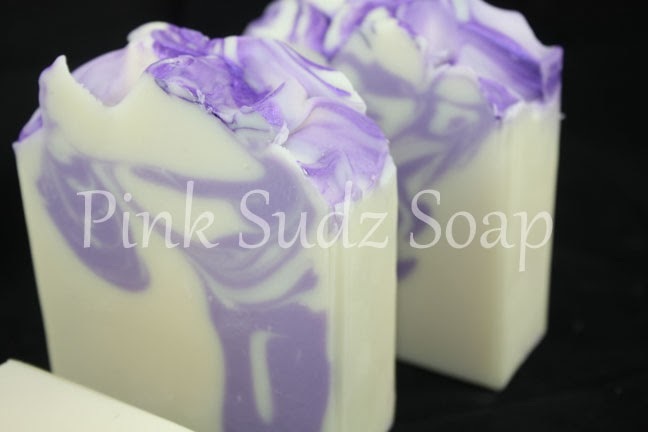 I love the swirls in this soap! Very inspiring!